With Bono relocated to Africa you’d almost forget that it’s all about guitars, baby. 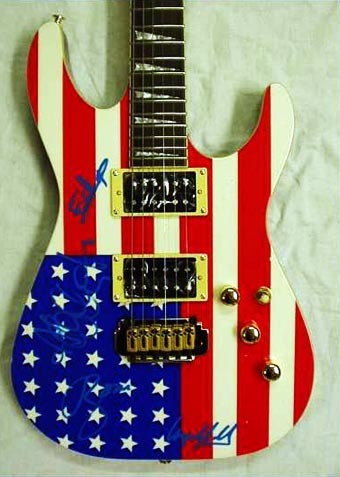 And now you can own one, signed and looking all patriotic – if you’re American, that is. Currently on auction at E-Bay, this item’s now priced at US $580.00. Doesn’t look like Edge’s autograph to me. His E’s are different. I was wondering if it was a fake. $820 for the guitar seems really cheap. And it seems that the signatures in the guitar are fakes. It’s hard to see Bono’s and Adam’s sigs, but the Edge one looks fake. BTW, this item DID sell, for $820…guess the buyer didn’t read these comments! Man, I was able to tell it was fake after the first glance. I was lucky enough to get Adams and Larrys auto in person last year on tour, and the signatures, mostly Larrys looks almost nothing like the one on the guitar. And,you guys are right, Edges “E” is way off too. That Edge autograph is really a poor one. I could do better than that!! Edge’s E’s are really big, and the rest of the name is smaller….Edge. That one looks like EDGE but really short and fat….and I just had 5 too many minutes on here…..
What makes this even more of an atrocuty is that U2 has never played on a “metal” guitar…one which is obvious to spot from the first glance. Jackson, etc. They should have at least made it on a Fender Strat….or a Gretsh…or a Les Paul. If your going to be creative, do it right! Another 5 minutes of time wasted. What makes this even more of an atrocity is that U2 has never played on a “metal” guitar…one which is obvious to spot from the first glance. Jackson, etc. They should have at least made it on a Fender Strat….or a Gretsh…or a Les Paul. If your going to be creative, do it right! Another 5 minutes of time wasted. I’ve been obtaining autographs in-person for the last 8 years, since I was about 12 years old. I’ve met Bono about 5 times since I started and he’s always refused to sign high-end items (like guitars) in New York City. He’s also refused microphones many times. Still, his signing habits may differ from location to location – maybe he just won’t do it in New York. I did manage to get Bono on a guitar pickguard at Roseland Ballroom a few months back though. Here is the link: http://cgi.ebay.com/ws/eBayISAPI.dll?ViewItem&item=890730004 – judging by your authenticity standards, I’d call my autograph a “fake” – but since I obtained it myself, in-person, I know for a fact it’s real. The only way I know of to have Bono sign a guitar is to frame a pickguard so it appears like a piece of paper – with only a small white square showing beneath an 8×10 photo or a CD cover – then asking him to sign the white square (which is actually a hidden pickguard) – a very shady method, but it works. Disrespectful? Maybe. But Fake? No. This seller “AXOP” on Ebay has sold SO many fake U2 items. It’s really sad! The sigs aren’t even close!